You will be issued with our standard terms of business at either the first or second meeting. This sets out clear guidelines for the rules and regulations by which we are bound. 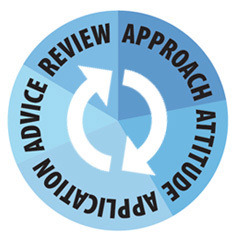 Our advice process is based around three key pillars: our triple ‘A’ stepping stones of Approach, Application, and our Advice. We carry out a detailed exercise to listen to our clients around the subject of your financial circumstances. We record in detail the assets and liabilities, income and expenditure, existing life and serious illness cover, protection policies, savings, investments, loans and retirement plans. We listen to you our clients articulating your goals and concerns and what you want advice on. We record your priorities and agree your agenda. This phase is completed when a detailed financial fact find is prepared. Having a budget identified for the planning need is most helpful at this stage. Your attitude to investment risk is a critical part of the initial fact find and we ask our clients to complete a risk profile questionnaire to help us understand this better, and your attitude to life’s risk helps us understand your disposition toward protection solutions. We draw on our experience and knowledge to firstly analyse your financial details. Our careful analysis will reveal financial planning gaps. We help identify these gaps in your planning requirements and needs. The gap analysis points to needs which are not provided for properly. During this phase, we apply tools and techniques to properly assess and measure financial requirements suitable to your needs based on your individual circumstances and outcome requirements. At the end of this phase, we research to consider options for the most suitable financial solutions and outcomes. The output from the initial 2 phases will provide a platform to prepare a tailored financial plan for you. This will entail a detail of reasons why we recommend the actions we advise and why the advice is in your best interest. Our advice will set out a plan of action which may or may not include arranging a suitable financial product. Financial products by their nature are typically long term and benefits and outcomes can be some time into the future. For this reason, they are complex and the need for understanding the product key features and the need for suitable products are accordingly areas to which we apply our specialist knowledge and expertise. When you are happy with the advice, we make the necessary arrangements to assist you implement your financial plan. Typically, we would carry out an annual review with you. Your personal circumstances will change often and we feel that 1 year is a recommended time frame between reviews. However, there are occasions when reviews are required more often depending on your own individual circumstances. Very often, life’s events trigger the need for an immediate review. E.g. death, accident/critical illness, birth, loss of job, business start-up, increased or lower earnings, retirement, inheritance, unexpected windfall etc.